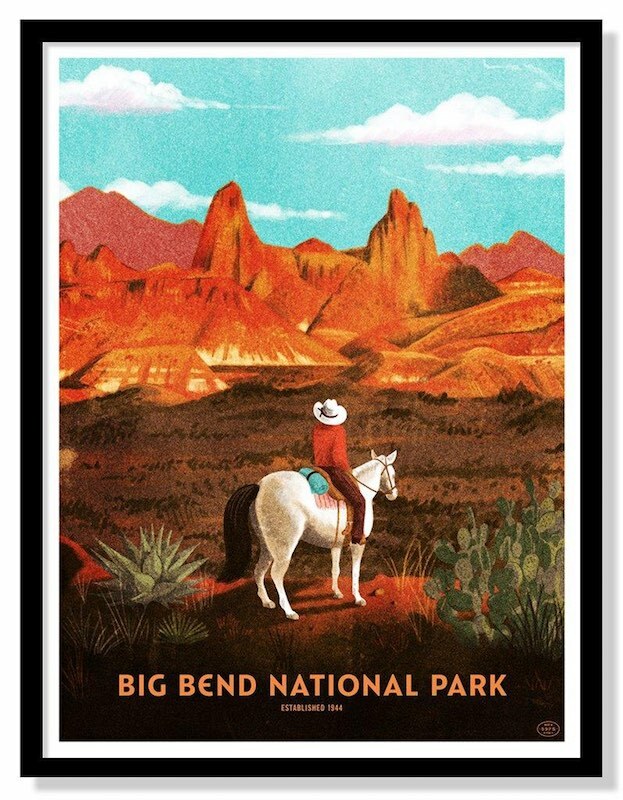 JP Boneyard is leading the charge to bring 50+ poster artists together to chronicle moments and memories from every U.S. National Park. Across this two year venture he has toured the country with shows at SXSW, Disney, Nike, and the Library of Congress, and has brainstormed countless ideas to take these beautiful designs into new formats. I caught JP for a quick Q&A about the Fifty-Nine Parks Print Series before he left on a four week west coast tour. DOES MEMORY PLAY A ROLE IN CHOOSING NATIONAL PARKS? Yeah the parks serve many functions. They’re a place you can go to turn off from all the noise and be totally delighted. The posters represent a single slice of each park that hundreds of thousands of people can relate to. Maybe they’re a callback to memories of family trips or a destination you hope to one day visit. They’re a call to action to get out there! WHAT ELSE WILL YOU DO WITH THE ART? WHAT’S YOUR FAVORITE PARK MEMORY? I visited Zion and, at first, had no interest in hiking the part from the poster. Mostly because I didn’t want to die (the series isn’t over yet). But I ended up doing it and climbed the up the side of the mountain with hundred foot drops on either side, pulling myself up burning hot chains in 110° weather, because I wanted to stand where the hiker was on the poster. DO YOU GET GOOD FEEDBACK AT THE SHOWS? Some people are picky because, according to them, we didn’t pick the right spot to depict. It’s so hard to narrow down these huge parks into a single image! But most people have great reactions and like to reminisce. People in their 70s or 80s come up and tell amazing stories about how their father helped build the roads at the location or couples who got engaged in the parks. For more about JP Boneyard, visit his website.